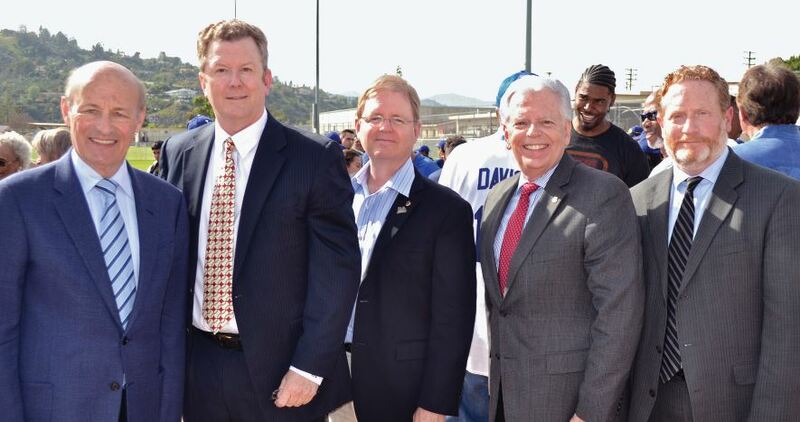 At the dedication ceremony for the renovated John Muir High School baseball field, named after Jackie Robinson, are (from left) Stan Kasten, president and CEO of the Los Angeles Dodgers; Rich Webster, board member of the Helen and Will Webster Foundation; Brad Ratliff, president of the Tournament of Roses; Bill Flinn, executive director of the Tournament of Roses; and Patrick Conyers, executive director of the Pasadena Educational Foundation. These are the poignant words of Jackie Robinson, one of the most significant pioneers in the history of a country founded by them. Before he became the first African-American to play major-league baseball, persevering through prejudice to pave the way for countless others in every walk of life, Robinson grew up right here on these Pasadena streets. It’s been exactly 80 years since Robinson graduated from John Muir High School in the city’s northwest corner, where a baseball field came to represent the platform on which he would ultimately cement his legacy. But that field did not age as gracefully as Robinson upon his departure from the school — then known as Muir Tech — and it was eventually moved to another plot of land on campus. 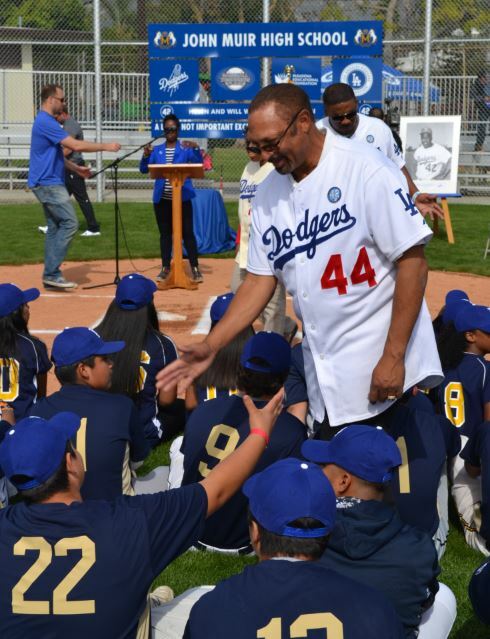 The relocation did little to prevent its continued deterioration throughout the decades, which is why earlier this month a newly renovated field on that same plot of land was dedicated in Robinson’s honor after the Dodgers, the team that famously gave him a chance back in 1947, stepped up to the plate once again. Helen and Will Webster Foundation board member Rich Webster, Pasadena Unified School District Superintendent Brian McDonald, John Muir High School Principal Tim Sippel and Pasadena Educational Foundation Executive Director Patrick Conyers flank a framed photograph of Jackie Robinson that will hang in the Muir gymnasium. Last April, Los Angeles Times columnist Bill Plaschke brought to light the plight of Muir’s baseball program, intertwining the Mustangs’ struggle to remain competitive with the dilapidated state of their playing surface. 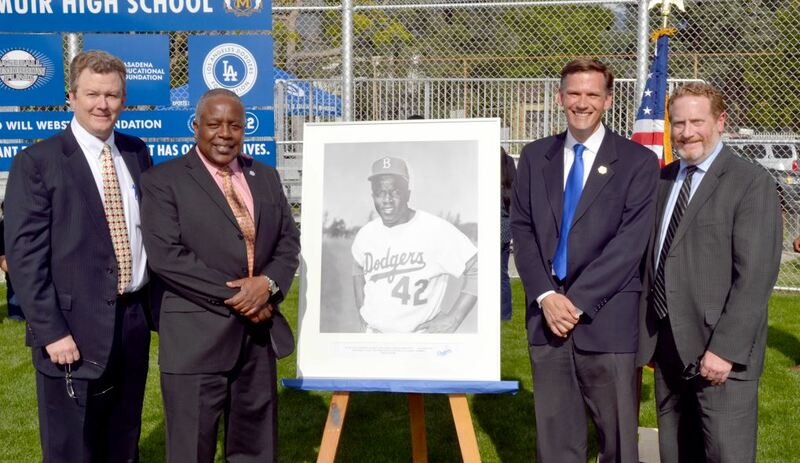 John Muir High School Principal Tim Sippel stands next to a Jackie Robinson exhibit inside the school’s museum. 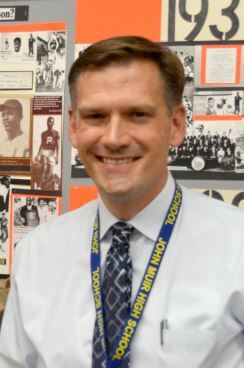 Robinson attended Muir in the 1930s after his family moved to Pasadena from Cairo, Ga.
Muir principal Tim Sippel, recalling ditches that passed as base paths and the hidden patches of uneven landscape. The Dodgers sprang to action. Kasten immediately pledged $100,000 toward a refurbishment project at Muir as part of the “Dreamfields” initiative within the Los Angeles Dodgers Foundation, the official team charity. Traditionally focused on rebuilding fields at local parks rather than high schools, “Dreamfields” was eager to get started at Muir. “This is an exceptional situation because of Jackie’s legacy,” Sippel was told. But since the field had fallen into such disrepair, additional funds beyond Kasten’s initial donation were likely going to be necessary for a full-scale renovation. The Baseball Tomorrow Fund, the Helen and Will Webster Foundation, and Nick English offered contributions while local organizations such as the Tournament of Roses and the Pasadena Educational Foundation joined the cause, too. Construction for the $260,000 endeavor began in November and involved new fencing, foul poles, bases and dugout roofs. A new bullpen, LED scoreboard and irrigation system were also installed. The entire field, rebranded as “Stadium 42” in honor of Robinson’s jersey number with the Dodgers, was regraded and topped with fresh sod as well as infield dirt. Various companies provided covers for home plate and the pitcher’s mound, along with field hoses, grass conditioner and a specialized lawn mower, to ensure proper maintenance into the future. The finished product similarly resonated with Brad Ratliff, the 2017 Tournament of Roses president. Like Robinson, Ratliff graduated from Muir and UCLA. The current ambassador for one of the city’s most storied traditions understands that Robinson’s legacy is just as important to the fabric of Pasadena. Brian McDonald, superintendent of the Pasadena Unified School District, agreed with Ratliff’s sentiment. “It’s a source of pride for the students, it’s a source of pride for the employees in the school district and it’s certainly a source of pride for the community members,” he said. Former Los Angeles Dodgers outfielder Kenny Landreaux greets sophomore Valente Vera of the John Muir High School baseball team. Landreaux caught the final out of the 1981 World Series. In poetic fashion, Muir’s varsity baseball team picked up its first win of the season the day before its new home field was unveiled. The victorious Mustangs’ players attended the ceremony along with their counterparts on the softball team and not only received tickets to Jackie Robinson Day at Dodger Stadium next month, but also got to meet several former Dodgers who participated in the festivities. Tommy Davis, Kenny Landreaux, Dennis Powell and Derrel Thomas mingled with the student-athletes before running a clinic for them on the freshly manicured grass later in the afternoon. The following week, Muir’s baseball team played its first game at Stadium 42 against Compton Centennial High School.